Discussion in 'Classic Menswear' started by jhcam8, Oct 2, 2011. Ascending to the Iron Throne. The Horween shell colors and shoe choices are sick. Nice... also the trousers. You have a good alterations person (so hard to find). Have been tuning into black shell recently with 2 recent purchases, wearing 4+ years old Dundees today. Still mesmerized by @wristandfeet 's seamless backside on those whiskey shell Vass. That was brilliant. I agree with the black shell choice. Not a lot of love for black shell on the thread, but it is a staple in my closet. I think a wide selection is justified. AE Leeds and the Alden shell has been spoilered. Great series of shots, thank you. I am (will soon be) at 5 black shell items and am looking for opportunities to slip them into my day. thanks for the PSA. Would you mind linking me to the Ron Rider thread? I ran out of patience trying to search for it. They are aiming to satisfy the "up to size 15" niche, I'm gonna have to reward that! Received my eBay shell Trickers today and happy to say they fit good comparable to Carmina Detroit last. These were really new in the box seems the guy just tried them on a few times fantastic find. I wanted these for the unique shell color (cotto) I really haven't seen this in any other brand. They almost seem orange depending on how the light is hitting them. 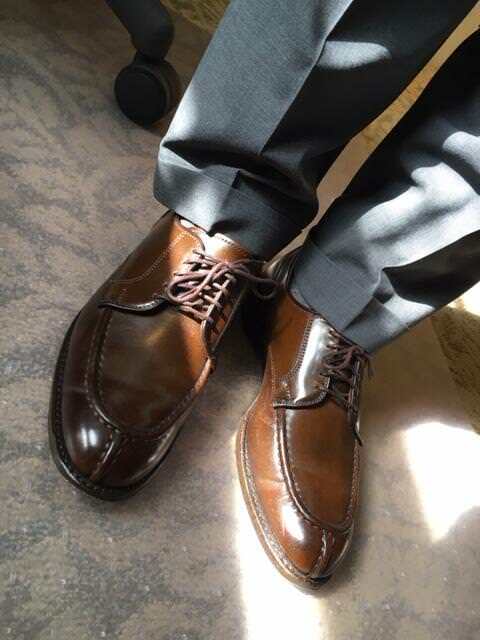 PTB's are among my favorite good looking workhorse shoes very versatile.